Surtur is a force to be reckoned with. Under the tanned creamy head, shades of fire roasted corn and burned sugar blend mysteriously with darker tones of chocolate, licorice, and strong coffee roasted by our friends at Te & kaffi. 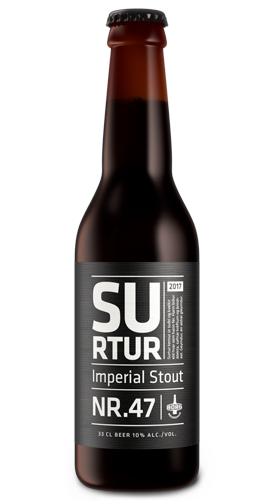 Ingredients: Pure Icelandic water, malted barley, malted wheat, coffee, hops and yeast.